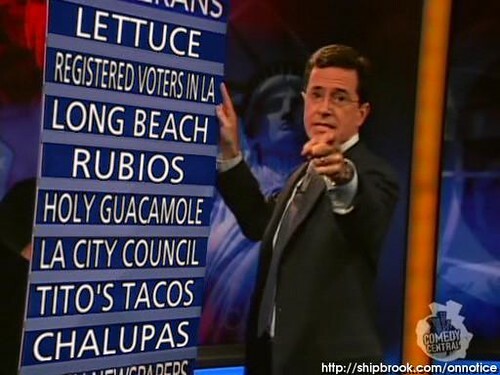 So yeah, the City Council Election didn't go the way this taco reporter wanted and we have to live the next two years with the anti-taco government we have elected. I say we but the sad fact is less than 10% of the registered voters showed up for this election. I didn't want to do this to you taco nation but I'm putting you on notice.Maybe next time you'll put down your Ipod or blackberry or whatever and participate in democracy. I didn't want to dwell on my election disappointment. I needed a taco and badly. I was in the valley on business when I got a call from a co-worker. "Hey, while you're in the valley you should try Hugo's tacos on coldwater"
"Oh ok..nevermind then...I just thought.."
"I thought you were a taco reporter"
The last time I was at Hugo's(before this hunt) all I wanted was a taco and I walked away with a buck and change left over from a ten spot. It's a tricky menu where you get enticed to keep adding to your order. But my criticism of Hugo's really stops and starts with the pricing because the food is actually quite good. 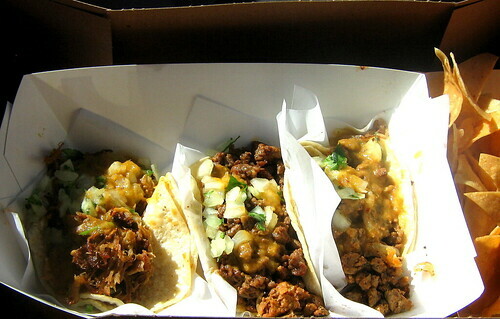 The tacos are small and $2.25 each(yikes) but if you order three it's $5.75. Well you're gonna be thirsty when eating those tacos so you'll need a drink right? Well a regular soda is $1.50 but you can add a regular soda and rice and beans or chips and salsa for just $2.00 . It's too good to turn down right? That's where my criticism ends though. Because I actually like this place. The salsas are pretty amazing. The habanero is too good for words. It's creamy and delicate and subtle...yes subtle..I didn't know it was possible to make a habanero salsa that didn't make you sweat like you were in the mojave but Hugo's has done it. Well I guess it's not too good for words since I just used words to descibe it. There are three steps to ordering. You choose a menu item, you choose the filling you want for that item (chicken, steak, grilled fish, carnitas, al pastor, plus two veggie options- zucchini-corn-string bean and soy chorizo-potato-zucchini) and you choose your salsa -( pico de gallo, jalapeno&tomatillo, salsa cruda, honey chipotle, salsa negra, salsa habanero, salsa arbol)I ordered carnitas, steak, and al pastor. The carnitas and the habanero were the perfect match. 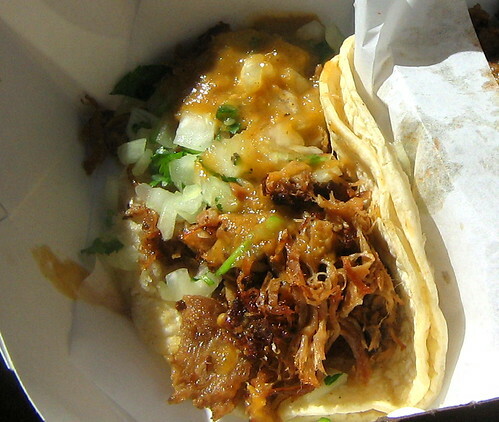 The carnitas was full of flavor and juice with a nice crunch at the edges. 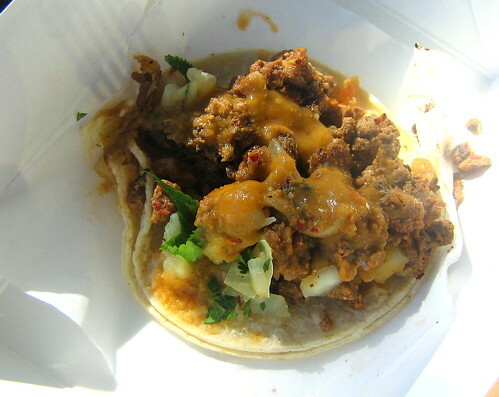 I loved it and was sad I only had one carnitas taco because the steak was just average and the al pastor was awful. The steak had spice rub but the flavor was bland and the al pastor was rubbery and crumbly and not authentic. The pastor is a new menu item so maybe they are still experimenting but if I was Hugo I would either go for making the authentic tacos de trompo or just remove it from the menu altogether. My impressions of Hugo's are mixed. I can't give Hugo's anything lower than a 3 taco rating simply because the carnitas and habanero was nothing short of a taste explosion. But I can't go higher than that because of the cost per taco factor as well as the steak being below average and the lack of authenticity of the al pastor. 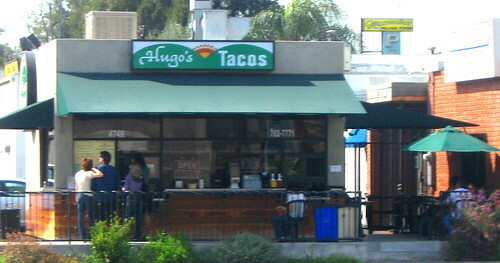 If you live in the area you should definitely check Hugo's out but if you're on the 101 and want to pull off for a quick taco you'll most likely walk away with more food and less money than you bargained for. 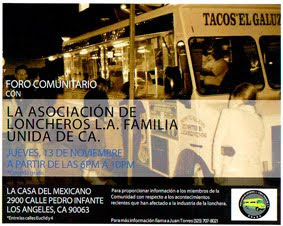 You should make a movie about this and continue on looking, please go to Laurel Canyon and Van Nuys blvd. and rate a few places. I actually like the white beans a lot and I think the chicken and fish both make for great tacos there. They also have a good soy chorizo for the veggies. Too expensive, yes, habanero salsa, yes. Yeah, the movie idea is great! It should be called Cheech and Chong go to Taco Castle. So original, don't you say?